Elemental ~ Jewelry With Substance: Ric Rac, Turquoise, & The Sandpiper! Let's move in for a closeup--I really like the earrings. Here, the jewelry is shown in daylight with no fullbright. I prefer that because I think there is more definition to the piece and the textures that way. But for all you gals that like your jewelry to show up at night, I've included a separate set of fullbright jewels in each package. And you can grab either the earrings or necklace for a steal this weekend--Only 60L each in the 60L Weekend Sale! 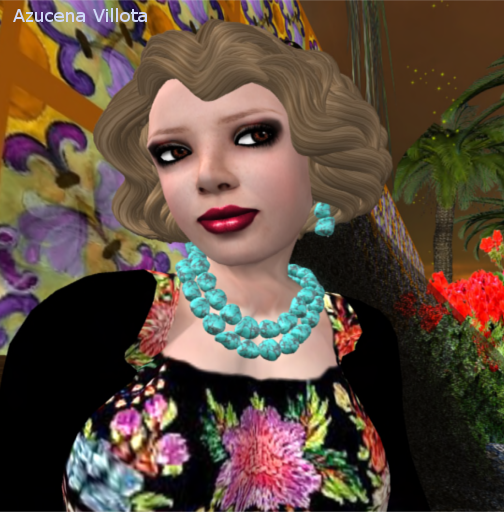 Here's my great friend Azucena Villota taking the recent Turquoise Challenge, wearing the ELEMENTAL Panache Turquoise jewelry set--for her favorite vintage look. Jewelry: ELEMENTAL JEWELRY Sierra Necklace & Earrings, silver, turquoise, & coral. On sale weekend of March 10 for the 60L Weekend Sale--60L each. Regular price--L$100 each. Hair: Truth Vicky, walnut. Purchase at full price. Skin: Curio Pout, dark sundust, indulged 2. Purchased at full price. Dress: The Sea Hole--Ric-Rac-Nroll Cherry Dress. Purchased on sale. Shoes: Honey Bear black pumps. Purchased full price a long time ago, still a favorite. Location: Two Moon Paradise, Sandpiper Art Gallery. Poses: Either WetCat, !bang, or Purple Poses--Sorry! I just can't remember which is which. PrimDolls: http://primdolls.blogspot.com/2012/03/formal-turquoise.html. Deoridhe Quandry takes beautiful photos, and her commentary is quite entertaining. A Dreaming Rose: http://laroseromance.wordpress.com/2012/03/08/im-a-barbie-girl/. Kidman Latte did a great spread featuring the Sierra set--with purple! Looked fantastic! Mode D'Espace: http://genexii.wordpress.com/2012/03/08/classic-whore/. Demona Zifer showed a very light, glowy version of the Sierra. Dove Treillis' Second Life Delights: http://sldelights.blogspot.com/2012/03/as-purse-is-emptied-heart-is-filled.html. Beautiful photos.